Taking a new demand management approach to achieve savings and improve outcomes in social care. Like most councils across the country, Hull City Council’s Adult Social Care (ASC) budget was under pressure, and demand for services was increasing. The council’s own change programme had identified the supply side opportunities to make savings, however they still needed to find an additional £15-20m of savings by 2020. "[After making changes during the trials], I felt the discussion was more about the customer." Designing a ‘Fast Forward plan’ for immediate interventions to deliver savings earlier and bring momentum to the wider programme. Implementing the Fast Forward plan. A new demand management approach was adopted to reimagine a social care system that would not only achieve the savings necessary, but be sustainable and improve outcomes. 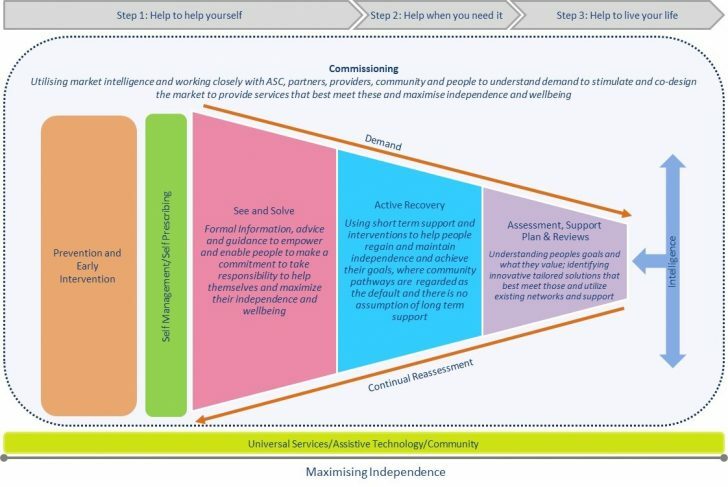 A new model of social care was devised, focusing on changing key demand levers across the customer journey and using behaviour change to influence the activities and decisions taken at the points which impact demand levels and flow. Articulated the core strategy and vision: Invested the time to fully understand both the council’s and the directorate’s ambition for change; no-go areas both from the centre and politically; and their level of ambition around integration. This enabled the team to rearticulate the vision for ASC, providing a framework within which the future operating model could be developed. Assessed current practice and identified opportunities: Analysed the current operating model and unearthed data to find out how it was really working. To do this, the team used a range of techniques including staff surveys, benchmarking, process mapping, workshops, observations and interviews. IMPOWER worked closely with staff to understand the work culture; the tools and support available to staff; and understand the plans in place for change. At this stage, IMPOWER created a bespoke Demand and Cost tool; which plotted values and costs against the customer journey to understand where in the customer journey the biggest impact could be had in terms of demand and savings (costs). As a result, the team identified several opportunities to help achieve the vision. Designed the new operating model: A series of workshops were held with ASC staff to co-design the new operating model. The team started by identifying what needed to be achieved for the customer at each stage in the journey, and the activity that had to be undertaken to accomplish this. This led to identifying the staff capability required and the processes needed, which were then linked to projected demand levels to ascertain the staff numbers The team were then able to review the current organisational structure and realign it to best achieve the new way of working. Created the evidence for the business case: Case reviews were conducted with both ASC and health colleagues, including social workers and occupational therapists. Demand management intervention were also trialled at the front door and at full assessment to provide evidence that the change would have an impact in Hull, and to bring momentum to the model with frontline staff and senior managers. Throughout the project, IMPOWER worked closely with the Hull CC ASC department to identify and develop the opportunities for how the department and the system could operate differently. In particular, the Demand and Cost was very powerful – it allowed us to have a clear understanding of the impact of individual interventions on cost and demand across the system. Of the three basic drivers of ASC costs – unit costs of care, process costs, and demand management – the third was by far the most impactful on delivering the transformation change required. Hull CC had done well achieving internal efficiencies by focusing on the first two drivers, and while there were still some opportunities within process and unit cost, focusing on demand led transformation offered the biggest potential benefit. At the front door, the trials demonstrated that a person was more than twice as likely to not require further support where the new approach was adopted. At full assessment, the trial showed there was the potential to change the outcome of an assessment or review in 47% of cases. Like any other council, Hull CC is facing significant pressures on its ASC budget, with differing perspectives from the service, centre and politicians about the approach and direction transformation should take. IMPOWER invested time and energy to bring internal teams together and on the journey with us, brokering relationships and bridging the gap between the service, the corporate centre and politicians. For IMPOWER, this is a crucial part of our approach to working with clients – ensuring that everyone is invested in the demand management approach so that change is sustainable. In Hull, as a result of this work, the future operating model and business case was signed off by all parties, paving the way for implementation.